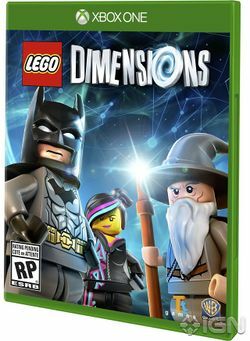 LEGO Dimensions is a video game released in September 2015. The game features levels from different themes such as Ninjago and Super Heroes as well as levels that merge all the themes together. The first set of releases includes characters and builds from The LEGO Movie, DC Comics, The Lord of the Rings, The Simpsons, Ghostbusters, Back to the Future, Ninjago, Legends of Chima, Scooby-Doo, Doctor Who, Jurassic World, The Wizard of Oz, Portal 2, and Midway Arcade. The second set of releases, starting in September 2016, introduced another 16 franchises, including Ghostbusters 2016, Harry Potter, The LEGO Batman Movie, Fantastic Beasts and Where to Find Them, Teen Titans Go!, LEGO City Undercover, Adventure Time, Sonic the Hedgehog, The Goonies, Mission Impossible, E.T. the Extra-Terrestrial, Gremlins, Beetlejuice, The A-Team, Powerpuff Girls, and Knight Rider. Lord Vortech is attempting to control each of the 14 LEGO dimensions. Batman, Gandalf and Wyldstyle team up to stop him. Along their way they meet various friends and foes from the different dimensions. That was heavy! Complete Back to the Future! This page was last edited on 18 November 2017, at 21:02.